The corrosion protection in the fender seam must be applied on all replacement parts, on which the attached seal is not already present. The additional corrosion protection seal will prevent “chafe marks” in the fender wheel housing liner. – Apply filler to the interior and exterior areas of the fender. – Once the filler has dried, apply and spread the Sealing Material -D 511 500 A2- in the wheel housing liner contact area (fender seam). 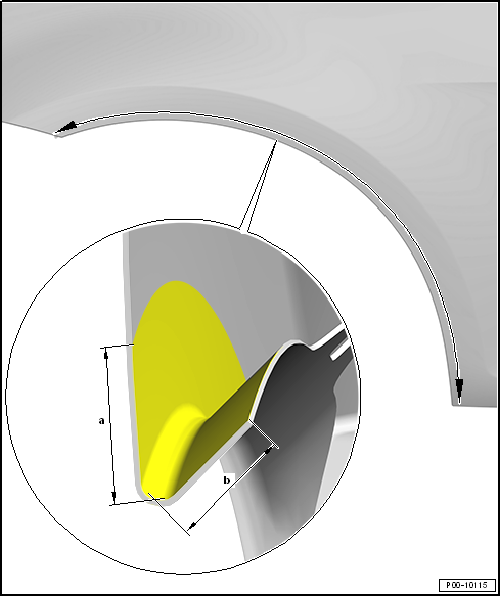 The dimension -b- can vary, because the fender has different folded edge widths. Note that the entire folded edge is always sealed. Before installing, the inner sides of the wheel housing and the fillet plate are to be sealed with cavity sealant. Refer to → Chapter „Preservation“.